The ideal light for the big jobs, the Power Towers are both versatile and portable. Powerful enough to light up to 6 acres, durable enough for construction sites, portable enough to fit in the trunk of a car. Light Head comes off for easy Transportation. Mast Extends from 7' to 12.5'. Urethane Spring Mount Cushions Bulb & Fixture from the Rigors of Jobsite Usage. Fixtures Swivel 360° for Lighting Vast Areas. 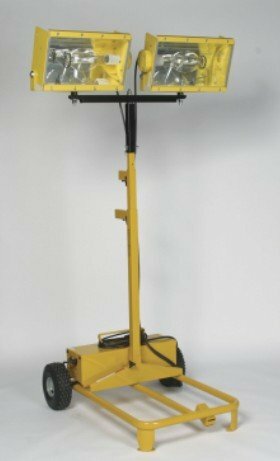 Steel Mast With Auto-Lock Position For Easy Set-Up, Take- Down & Height Adjustment. Metal Halide lamp (included) rated for 10,000 hours. Brakes lock unit in place. Folds up to 19.5 "High. Rolls Anywhere - Fits through a 32" door. Rubber-Mounted Ballast Box has Weatherproof On/Off and Larger 1-Piece Cover for Easy Accessibility. Base large enough to support generator.